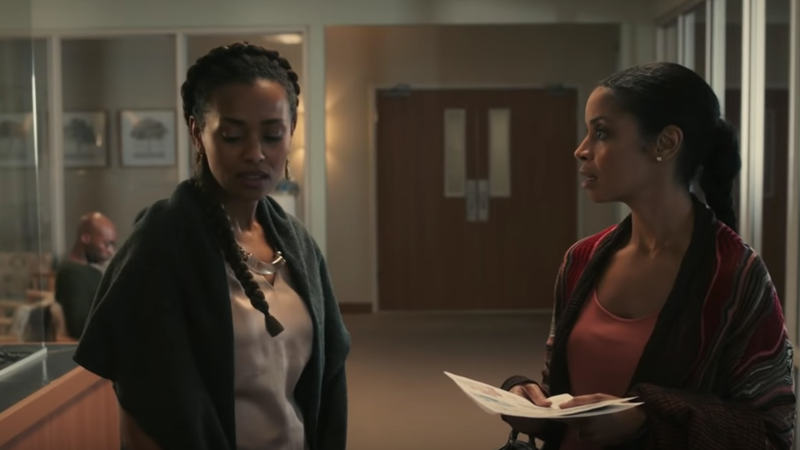 (L-R): Melanie Liburd (Zoe) and Susan Kelechi Watson (Beth) in This Is Us. Editor’s Note: Beware of Season 3 finale spoilers! The third season of NBC’s hit drama This Is Us just wrapped on Tuesday night, leaving its audience in a glass case of emotions. Lots of emotions. A rollercoaster ride of emotions. Though we get to breathe a huge sigh of relief knowing the fate of Beth (Susan Kelechi Watson) and Randall (Sterling K. Brown) Pearson, things aren’t looking so good for Zoe (Melanie Liburd) and Kevin (Justin Hartley). In the season finale, entitled “Her,” Kevin and Zoe break up. WHYYYYY?!!? I know why, but whyyyy? They were cute. Still, it looks like Liburd won’t be returning for Season 4. She had just gotten upgraded to series regular for Season 3, too. See? Rollercoaster. In fact, recently on the 50th NAACP Image Awards red carpet, I told Liburd just how much she and Hartley were stressing me out. “I‘m having so much fun right now, it’s brilliant! And we are so fortunate to have such amazing writers. My storyline this season has been so rich and full of so much detail—the relationship I [portrayed] with the Kevin character — and to work with such a brilliant cast, I feel so grateful,” Liburd told The Root on Saturday. As with anything on This Is Us, nothing is set in stone. You may see something and think it means one thing, but it, in fact, means another. As we saw in the flash forward sequence at the end of the Season 3 finale, Kevin has a son. With whom, though? One thing’s for sure is the concept of possibility. It is possible that Zoe would return to the show as a character. “Whenever there are opportunities for Zoe to come back—which [would be] pretty organic because she touches on Kevin’s life as well as, of course, Beth and Randall’s life—we’re eager to have her back. ...We love Melanie so much. She’s a friend of the show and she did an amazing job for us; we love her both as an actor and as a person,” added Aptaker. “She is a Pearson family member and we love her, so I think it’s safe to say you will be seeing her again,” added producer Elizabeth Berger. During our weekend red carpet chat, I had no idea Liburd wouldn’t be returning for the fourth season, but I did get to ask her about her fondest memory shooting the series. Maybe it was foresight, maybe it was just because I love behind-the-scenes scoop. Likely the latter. “One of my favorite memories was going to Vietnam. We sent a small crew and the cast — I think it was just me, Justin and Milo [Ventimiglia] — and it was just so amazing. We’re very fortunate to [be able to experience that with] our job. It was great to experience a new culture, food, and the views of the landscape,” said Liburd. I’ll miss me some Zoe and will be awaiting (and demanding) her return.